Far-right ideas about race and intelligence are migrating into the mainstream — and not just in the US. But there is something different about the present battle. Though the fact has escaped notice in the United States, the last few years have seen the globalization of the IQ wars. Arguments from the far-right fringes have entered mainstream politics, not just when the world’s most powerful leader states his preference for Norwegian immigrants over Haitians and Africans but in the site of the twentieth century’s most murderous racist project: Germany. For the last fifty years, the keepers of the flame of the idea of genetically based racial differences in intelligence have been the small group of psychologists and sociologists affiliated with the Pioneer Fund. Founded in 1937 for the “improvement of the white race,” the fund has been headed since 2013 by the notorious racial psychologist Richard Lynn, most recently in the news for his involvement with a secret eugenics conference held at the University College London. Such league tables and maps have become the lingua franca in policy and journalism circles from the World Bank to the Economist amid recent fascination with human capital and the knowledge economy. Lynn’s invocation of “genetic human capital,” while bizarre for actual economists, piggybacks on the trend to claim an unearned legitimacy. He uses mainstream research to prove his points, referring not only to prenatal genetic screening — which he supports — but also to Freakonomics author Steven Levitt, whose work on abortion and crime he sees as evidence of positive eugenics in action. In 2010, Lynn’s racialist intelligence arguments rode the wave of interest in public education and population policy into political discourse in Germany. 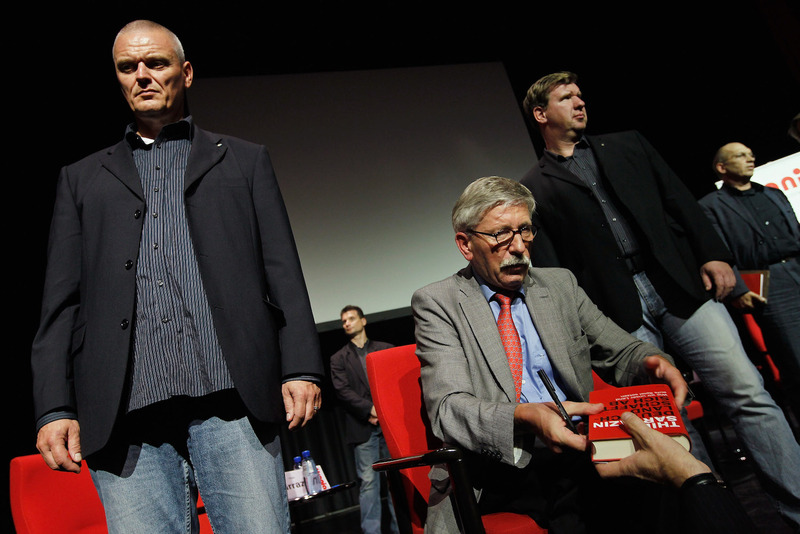 That was the year of publication of Germany Does Itself In, authored by the social democrat and former Bundesbank board member Thilo Sarrazin. The book has since sold over 1.5 million copies and been seen, justifiably, as laying the intellectual groundwork for xenophobic parties such as the far-right Alternative for Germany and the newly successful Austrian Freedom Party. Like Murray, who worked for the American Enterprise Institute for over two decades, Sarrazin crosses over into free-market advocacy circles. He has been hosted more than once by the Hayek Institute in Vienna and the Hayek Society in Germany. Sarrazin’s book draws on the work of Murray and Herrnstein, Lynn and Vanhanen, and other Pioneer Fund beneficiaries to argue that, because intelligence is “50 to 80 percent heritable,” and the rich tend to be smarter than the poor, the falling birth rates of the rich and intelligent will ultimately lead to a drop in overall German intelligence. He pins most of the blame on Germany’s Muslim migrant population, who he says are both the least intelligent and most fecund. Beyond a general opposition to welfare support for the indigent and concern about mismatch with European values, group differences in intelligence become Sarrazin’s strongest case for stopping immigration from Muslim-majority countries. What is the special resonance of the IQ test today? The fixation on intelligence is a fitting form of racial science for the postindustrial age. It is built upon mainstream concerns about the knowledge and innovation economy, national competitiveness, and analogies of human beings to information processors. It thrives on the craze for standardized outcomes, rankings, benchmarks, and indicators and offers a simple and powerful story about the world that naturalizes and hardens existing hierarchies, reinforces folk understandings of difference, and disempowers efforts of collective reform. Perhaps most effectively, it does so with the elegance of a single number — IQ becomes a biologized credit score etched onto human nature. The renewed fascination with intelligence testing offers more evidence that the supposed backlash against neoliberalism in the form of right-populist and racist political movements only deepens the reduction of human nature to fitness for the market. Quinn Slobodian is ACLS Frederick Burkhardt residential fellow at Harvard University’s Weatherhead Initiative on Global History and associate professor of history at Wellesley College. His most recent book is Globalists: The End of Empire and the Birth of Neoliberalism .